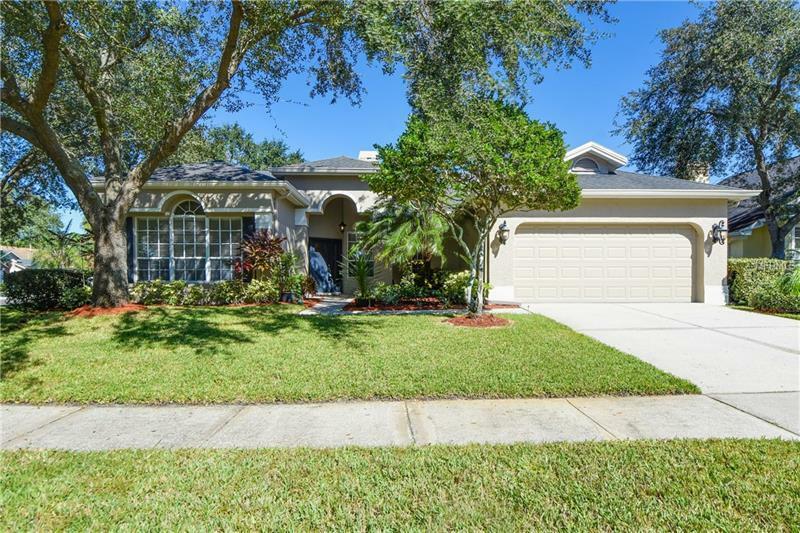 Beautiful Westchase 3BR/2B + Den with 2-car Garage home. Open Kitchen adjoins Family Room with FIREPLACE - perfect for family gatherings and entertaining. Kitchen offers GRANITE countertops, sleek appliances with 5-burner gas cooktop (with option to switch to electric cooktop), bar stool counter, plus informal eating space. Master BR overlooks the POOL, Master Bath with GARDEN TUB and separate shower recently updated with FRAMELESS GLASS DOOR. Split bedroom plan. Relax on expanded covered and screened PATIO overlooking the pool. Newer roof March of 2010 with 30 YR warranty, newer AC unit installed 2012, newer high efficiency Kohler toilets installed in 2017, newer THERMA-TRU FRONT DOOR installed in December 2017, new GAS WATER HEATER installed in Jan 2018, new CARPET installed in Aug 2018. Westchase is one of Tampa #39;s Premier communities, offering golf course, 2 community pools, tennis courts, parks and playgrounds. Just minutes to upscale shopping, restaurants, A-rated schools. 20 minutes to Tampa Airport, 30 minutes to Downtown Tampa, and 35 minutes to Gulf Beaches. Very low community fees. Everything you are looking for.